You bring a stroller so that those little legs won't have to do so much walking (and because then you'll know exactly where they're at), but then they decide that they'd much rather be the one pushing the stroller. 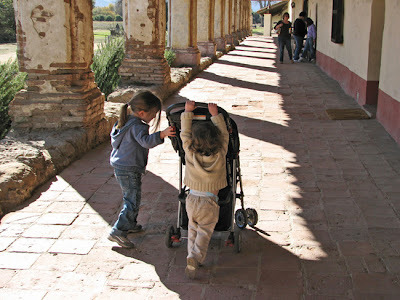 Next time you're at a zoo or Disneyland or anywhere a small child and a stroller might be, look and see if you don't notice any tiny ones pushing their own strollers. I have a 16 month old and a 2 1/2 year old and they do not want to be in the stroller any longer. They want...the wagon instead now. Great photo! i love this shot! The girls look like they are having a lot of fun pushing that thing. I also like the colors and tone of this shot. This IS a great shot! Have you tried making in sepia toned because it would look cool all old mission looking. Too true about the stroller thing!! I never bring a stroller anywhere anymore. If they can't walk then it's time to go home. We still have to carry Ryan every once in awhile (like a late night at Disneyland). The only bummer is that you also have to carry all the junk you used to put under the stroller. No one is able to push strollers anwhere in my neighborhood, thanks to snow and sleet that froze on unshoveled sidealks. Ah, to live in sunny, WARM Southern California!